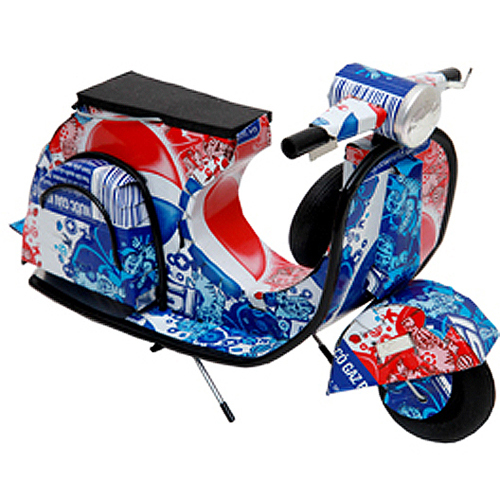 This is the first respectable looking site I’ve come across that features the pop can scooters. (And here’s some kismet – they’re located in Brighton!) They’re handmade out of recycled cans and have movable steering, rotating wheels and even a working kickstand. You can choose from Coke, Pepsi, Heineken, Tiger Beer, Schwepps Tonic or Schwepps Soda. They measure approximately 18cm x 11cm x 9cm or approximately 7″ X 4.3″ X 3.5″. They cost Â£9.95 each and come in a gift box made from 100% recycled materials. The site does note that these are not meant to be children’s toys. This entry was posted in Art, Decor, Food, Wine, Models, Figurines, Toys and tagged aluminum can, brighton, coke, ecologic cool, ecologiccool.com, heineken, pepsi, recycled art, schweppes soda, schweppes tonic, scooter, tiger beer, tin can, vespa by Tracy. Bookmark the permalink.